The Taurus Express travels along an ancient route from Istanbul to Gaziantrep on the eastern Mediterranean. Originally the railway travelled on to Damascus in Syria and Baghdad in Iraq, though there is still a once-weekly sleeper car service on to Aleppo. 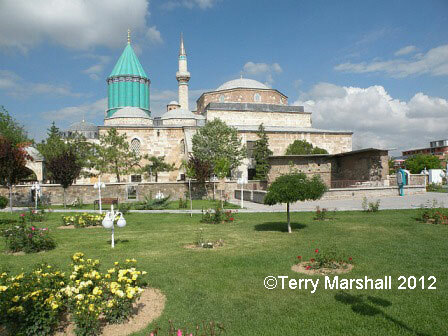 Upon leaving Istanbul, the train soon reaches the vast Anatolian Plateau, passing through Afyon, with its ruined Black Fortress of Opium, and Konya, home to the mausoleum of the Sufi poet Mevlana Rumi, founder of the Whirling Dervish sect. The train then climbs through the Taurus Mountains with stunning views of gorges and deep mountain valleys. Descending to Adana, the railway follows the coastal plain to Gaziantrep, home to the 9,000 year old Kale citadel. The whole journey of 1,140km takes some 27 hours - reservations are required and you need to bring your own food and water as there is no restaurant on board. 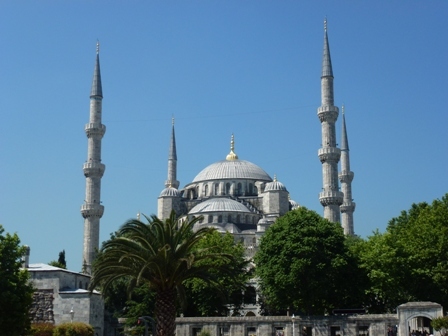 Organised group tours: Click here to see 3 tours to Turkey which may include Taurus Express. Turkey's most important city spans Europe and Asia across the Bosphorus and has been capital of three empires - Eastern Roman, Byzantine and Ottoman throughout its history (including its previous incarnations as Byzantium and Constantinople). This has left it with an incredibly rich historical heritage that makes it one of the great cities of the world. The Blue Mosque is perhaps the city's most famous sight, built by the Sultan Ahmet I in the 17th century, with a stunningly impressive scale and elegant design. Aya Sophia was built as a Byzantine Christian church in the 6th century, converted to a mosque after the Islamic takeover in the 15th century and now a museum. Its huge dome and walls include some superb mosaics. The 4th century Hippodrome of Constantine was the site of political demonstrations, chariot races and polo matches. Topaki Palace, built in Islamic style, was the home of the Ottoman sultans for four centuries. Other buildings of note include Suleymaniye Mosque, the Kariye Camii church and the ancient ramparts and aqueduct. One of Istanbul's most famous attractions is the vast Grand Bazaar, a labyrinth of some 4000 covered shops, caf�s and restaurants, where you can haggle for jewellery, clothes, sweets and spices. Konya is Turkey's holiest city and home to the mystic Sufi sect known as the Whirling Dervishes, founded by Mevlana Celaleddin Rumi. Known as Iconium in Roman times, Konya was capital of the Seljuk Turks in the 12th and 13th centuries. The Mevlana Museum contains the tomb of Mevlana and other important leaders of the sect, as well as some of Mevlana's handwritten manuscripts and other artefacts such as ancient carpets and musical instruments. The Taurus Mountains near Cappadocia in central Turkey offer a spectacular landscape that's ideal for trekking. The region is characterised by rugged peaks and high passes, mountain pastures and isolated valleys, dramatic canyons and deserted mountain lakes.